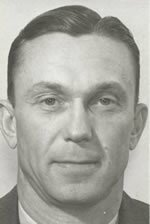 In 1941, Robert Whittaker became head football coach and served for 14 years. He found immediate success in his first season, guiding the Falcons to a 7-1-1 record. That would be the first of eight winning season posted to start his coaching career, culminating in a perfect 8-0-1 record in 1948, a year which also saw the revival of the athletic rivalry with the University of Toledo. That perfect season was unfortunately the high point in his football coaching career, as aside from a 4-4-1 record in 1951 and an impressive 7-2 mark the following year, four of Whittaker's last six seasons resulted in losing records, and he was replaced by Doyt Perry in 1955. However, Whittaker is possibly more well known as a track coach at BG, a position he held for ten years. His 1944 and 1948 teams each posted perfect records, while in 1956, his first year back after focusing exclusively on football, the team finished runner-up at the MAC Championships. Nine BG runners took first place in that meet. He would coach five more seasons, before retiring in 1960. In track, his teams won 77 meets and lost 40. The university track is named in his honor. He was inducted into the BG Hall of Fame in 1968.